We were looking for a change. A change of pace. A change of culture. A change in the routine. 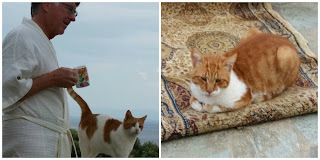 The day we had goats in the garden and the parade of gatas, (cats) at the door at our Stone House on the Hill in Greece’s Peloponnese, we knew we’d found the change for which we’d been looking. It was a warm summer morning – the windows were open and I was at the computer when I heard the unmistakable hollow clank of goat bells in the distance. The sound intensified along with the percussion of dozens of un-synchronized hooves trotting on the pavement. For we city-slickers-turned-Greek-olive-growers it was a call to grab the camera and race up the entry stairs to watch them pass our house. We don’t see sights like that in our other suburban world. Only they didn’t pass . . . City Slicker lesson number one: the herd came to a halt when they saw us. There they stood, blocking the public road. . .well, until they noticed our garden area and all the tasty morsels growing in it. Luckily the shepherd and his dog were quickly making their way from the back of the herd to the front and went to work doing what they do best: herding them back to the road and getting them on their way. Let’s just say the shepherd didn’t call out a happy greeting to the two of us as he passed. And Those Gatos/Cats at the Door. . . It began in December with the arrival at our door of a well-cared for cat whose owner we later learned had left her to fend for herself while he was on vacation. She first sat outside on our deck peering in the glass doors, so forlorn that within days she’d convinced us to let her inside. At first content to sit on a rug, by the time our three weeks there ended she seemed to reign over us and we’d named her “Princess” for the obvious reasons. She was sitting at the door again a few days after our return in the spring, but obviously was being well cared for and she didn’t stay long. She simply dropped in it seemed to eat a bit, sit on our laps and let us know she was doing well. “Princess” didn’t come alone last December. Within days of her arrival, her brother (according to our neighbors) arrived. Handsome as he was, he was an out-door cat who twisted me around his paw so easily that I ‘built’ him a cat house using carpet and plastic sheeting to protect him from the winter weather. He ate well while with us. We named him “Tom”, again, for obvious reasons. Tom returned this spring – in fact, within hours of our arrival at the house. He’d not fared as well as his sister and sported open wounds to his ears and had lost weight as well as a lot of fur to mites and ticks. Feeding him wasn’t enough, we made a trip to the vet to get medicine for his wounds and to eliminate the bugs. We later took him in and had his ability to father children taken away. We did that after the cat we believe to be his common-law wife arrived on the scene. We ended up naming her “Mom” for the obvious reasons. . . Within days of “Mom’s” arrival she brought the rest of the family – and you’ll notice the strong resemblance the wee ones had to Tom. Mom and the kids were feral, as are most of the homeless cats in our area. She finally let us pet her but the wee ones never came close. Tom, on the other hand, couldn’t get enough attention. They all become part of daily life at The Stone House on the Hill. Many of you followed our Facebook posts about the cats and have asked what happened when we left. Well, it was again a reminder of change in culture and routine. There, the cats, are just left behind because we were told, they move on to the next home when the humans depart. I couldn’t quite accept that so we had the gardener putting food and water out for them when he came to tend the plants and friends also came by with food. . .but apparently the cats did as we’d been told. They moved on and neighbors reported no signs of the cats return. I wrote this post back in the States but left it unfinished until our return to Greece. We arrived back at The Stone House on the Hill last week (and have been without internet because a mouse had eaten through the cable). Now that we are back in the Net World I must conclude this cat tale with happy news: Princess arrived at our door within minutes of our walking into the house. Tom appeared a couple hours later. They've been with us constantly - both appear healthy and well cared for. . .so who took care of them and where did they go? We have no idea. . .just one of 'those things' I guess. Mom and the summer babies haven't been seen. In future weeks I'll be intermixing Greek tales with continuing reports from our Middle East segment of the cruise. As always thanks for the time you spend with us and hope you'll return soon. They certainly know they have a good thing going while you're there. Funny about the goats. Push overs we are! Or easy marks. But they are pretty darn cute. Thanks for the visit Gaelyn. No goat or gata or anyone, really, would be able to resist that beautifully inviting entryway to your stone house on the hill, Jackie! I loved reading about your adopted felines who obviously have become family, but they really make me miss my own prince, Richard, that is! Do you remember him? Sadly, he has been missing for over 7 months, now and we've never found out what happened to him. The mystery is more frightening than intriguing, I'm afraid, as there have been rumors of poisoning, and other despicable behaviour toward these adorable creatures. I'm so glad your kitties are all doing well, and I believe that the others have made themselves very comfy somewhere just as hospitable as your own home was for them, for a time! I'm so looking forward to your stone house on the hill stories; thanks for this one! Beautiful scenes, and beautiful kitties! What an intriguing post. I'm going to see if I am a friend on facebook! Jan if we aren't FB friends, we should be - I am Jackie Humphries Smith (there are dozens of Jackie Smiths). I will try and find you as well! It must have felt like a great welcome and a sense of returning home to have Princess and Tom show up. Great story. Thanks much Donna. Always nice having you stop by. And they call them 'dumb animals' - I doubt if I could survive as well as they seem to be getting along. Thanks for stopping by. Lucky you! A nice read! Thanks much for stopping by - hope you'll be a regular here! How fun to have your own built-in animal community for your entertainment (the goats) and a cuddle (the gatos)! Just the right addition to make your new house a home! Anita, we made the observation the other day that it is nice to be welcomed home if even by stray cats who've adopted us! Thanks for the visit - hope you'll come visit us in Greece one day! Hahaha! Sounds like goats are the same all over the world!!! And so are cats! Have a great week! Glad to hear Tom and Princess came back to you ok. Looking forward to more. I really enjoy your blog. Thanks Karen and glad to hear you are enjoying the blog! Hope you'll be a regular here and soon I'll see you among the friends on the sidebar or Google + or simply back here again next week! Jackie, That's an interesting way to deal with stray cats. I would worry about them. Oh Corinne, let me assure you I do worry about them. In fact I lost more sleep worrying about Tom after we left last June than I did about Greek banks closing and the country's economic crisis. I am already worrying about when we leave in December and whether someone will look after them. I did hire the gardener to put food and water out every other day when he came to water the garden but the neighbors reported that the cats had moved on once we closed and shuttered the house. If I could take them with me, I would but this is their home so I've got to learn to live with it, I guess. Yes, Nancie I can assure you that he wasn't very happy with us! Another lesson learned. . . Right now the early morning symphony is a mix of rooster crows, a donkey braying and a cow chiming in for good measure. Percussion is provided by a dog's bark! I love it! Wonderful shots from garden. The cats are cute. Thanks for stopping by Rajesh! My goodness, what a different way of life. I know very well that goats love to eat plants and shrubs because the herd next door to our arboretum get loose sometimes and consider the grounds a buffet. I'm glad you both tend to the cats while in Greece and it's nice to see them return to your hospitality when you're back on the island. It is amazing and reminds us both of our childhood environments, while we didn't have goats in the garden we did have rural settings in which we grew up - it is nice having that simple life again. Change is a wonderful thing! How fun to see sights like these cute little fellows in your new neighborhood. Glad that the shepherd saved your garden from damage. Keep these slice-of-Greek-life posts coming -- love 'em! Change does shake up the system - both mental and physical and I guess that is why I love travel. If you and Mr. TWS ever get over this way when we are here, you'll have to come visit! Wonderful story about the gatas. You are a saint for taking them to the vet. I had one friend in Malaysia who made it her mission to "fix" all the stray cats she came across there. I like the goats story, mostly because it's neither my house nor my herd. I would have gone out with a camera, too. Michele, thanks for the comment. Those two - Princess and Tom - have made this house their home so once adopted, you just have to go with the flow. We had goats come down the street yesterday and I refrained from racing up the steps to photograph them. great photos...you are surrounded by critters! The best way to be Tanya - surrounded by critters. As always I love seeing your comments - have a wonderful day, Indrani! Goats in the garden, cats on the doorstep, and mice in computer! goodness! a regular animal haven! I once had a lizard get fried in the back of my computer at work. It created a laugh and head office believed that we really did work out bush. Oh Jill that is so funny. Thanks for stopping by. That is an amazing story about the cats! I was happy to read the happy ending to the tale! Thanks for stopping by Amy and I also love happy endings.